The hands are a prime age revealer second only to the face. They are frequently exposed to the elements such as the sun, wind, and dry weather, as well as being constantly immersed in water, soaps and harsh chemicals. Unlock the true potential for your hands to reverse the visible signs of aging to help repair rough, dry, worn, chapped skin and age spots. The Happy Hands Facial works to restore the youthful appearance back to your hands with a combination of the most innovative and therapeutic ingredients available. 1. To begin, hands are soaked in a warm therapeutic bath of Himalayan pink salt and essential oils to purify and soften the skin. 2. The hands are then exfoliated with an Amino Acid resurfacing polish for optimal smoothness, revealing a healthy layer of skin. the mask to penetrate deep into the skin's surface for effective nourishing and intense hydration. 4. A second cleanse is then followed by an infusion of Hyaluronic Serum to plump out fine. 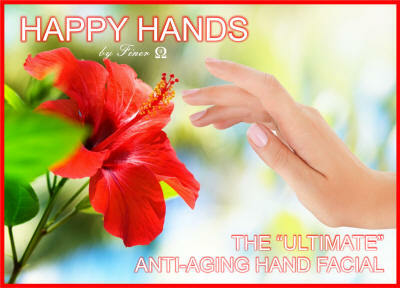 preserve all the goodness of your Happy Hand Treatment. 6. Finally, your treatment is veiled with a +50 SPF spray for sun protection. what your populace (area) is willing to pay. A fantastic business to add to your salon or to start up at home! Please email info@finerface.com if you wish to place an order.